Latex-free compression sleeves continuous squeezing action bolsters circulation and supports tendons. Compression garments are often worn to optimize athletic performance and speed recovery times, chiefly by boosting circulation and improving oxygen delivery. 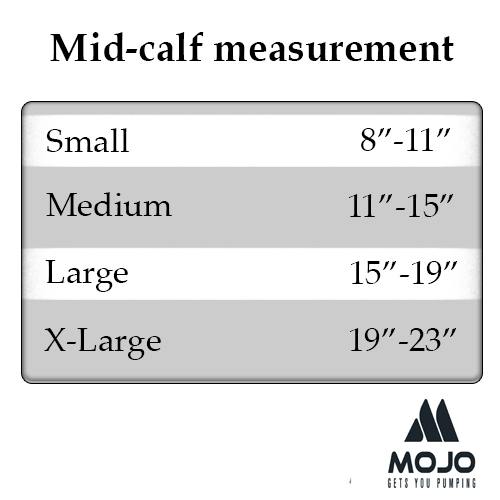 MoJo's team designed these calf sleeves specifically with runners' performance in mind. A latex-free blend of nylon and spandex is tightest at the ankle, graduating to a looser but still compressive fit around the calf to create a pumping effect on the calf and leg. The sockless design means runners can still wear their preferred socks and riding spurs. As the sleeves apply steady pressure during running, wearers may notice improved performance such as increased speed and reduced fatigue. This same compressive action may speed recovery when the sleeves are worn while resting. Sports Compression Sleeves provide ankle-to-calf graduated compression. Best for athletes who do not wish to change from their current running or riding socks - But still want the protection and improvement a graduated compression garment offers. Use the Compression Sleeve in conjunction with your favorite socks to improve endurance by boosting blood circulation and delivery of oxygen to your muscles. You'll run and ride with less effort, increased speed, decreased recovery time, reduced fatigue and optimized performance. Mojo Compression Sleeves feature 20-30mmHg graduated compression. Strongest at the ankle gradually decreasing up the leg, used by professional triathletes around the world, these are scientifically proven to maximize power, boost energy, and speed recovery time.